For more than two decades the second largest city in the United Stadium, Los Angeles, was without a professional football team. That changes in 2016 as the Rams move back to the city from St. Louis. The Rams move to Los Angeles is a homecoming as they played here from 1946 until 1994. They moved to St. Louis at the beginning of the 1995 season after failing to have a new stadium built to replace Anaheim Stadium. After the Rams left in 1994 numerous developers sought to build a new stadium in the Los Angeles metro area in attempt to lure the NFL back to the city. In January 2015, Rams owner Stan Koreneke announced plans to build a stadium in Inglewood, CA as he was unsatisfied with the Edward Jones Dome in St. Louis. The following month the San Diego Charges and Oakland Raiders announced they had partnered to explore the possibility of building a stadium in Carson, CA. On January 12, 2016 NFL owners voted to allow the Rams to move to Los Angeles for the 2016 season and construct a stadium in Inglewood. NFL owners also gave the Chargers a one year option to join the Rams, sharing the new Inglewood Stadium. In January 2017 the Chargers announced plans to leave San Diego and join the Rams in Los Angeles after failing to receiving support for a new stadium. 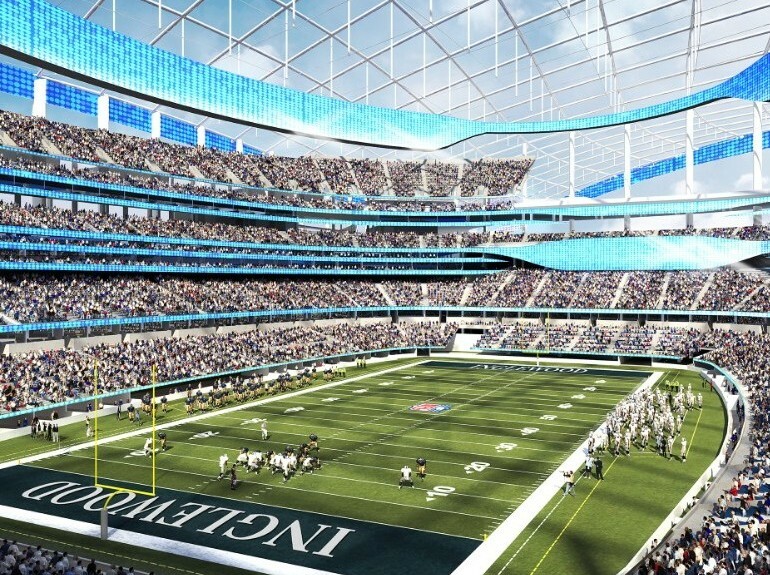 The new stadium in Inglewood, dubbed City of Champions Stadium, is scheduled to open in 2020 and will be home to both the Rams and Chargers. The stadium was originally scheduled to open for the 2019 season, but unusual rainfall in 2017 led to construction setbacks. It will be part of a proposed “NFL City” complex that will include the stadium, but able to host the NFL Draft, NFL Combine and the NFL Network. The multi-use complex will also include 6,000 seat performing arts venue, a champions plaza, a lake, retail and office space, a hotel and housing. The stadium will have a low-profile, the field 100 feet below street level and the roof rising to 275 feet above it. The roof, in the shape of a massive sail, with be constructed of transparent glass allowing natural light into the facility. Side openings will allow breezes to flow throughout the stadium. It will have a seating capacity of around 70,000 that includes 250 luxury suites and 20,000 club suites. Furthermore, it will have many premium spaces including luxe cabana, a field level beach club behind one endzone and small suites in the stadium’s upper concourses. The stadium will have one of the most unique video systems in the NFL. Nicknamed, Oculus, the oval shape, two sided video board, will hang from the roof of the facility, and will be 50 feet tall by 120 yards long. The privately financed stadium will cost up to $3 billion dollars. 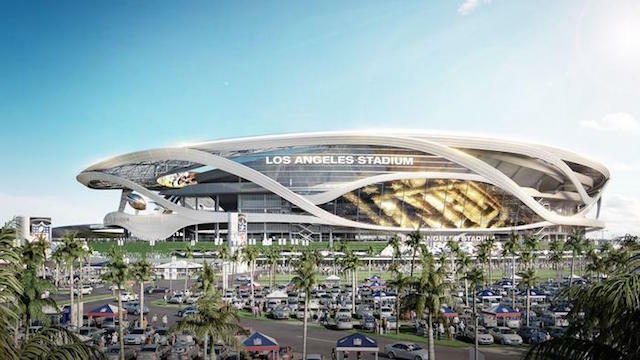 Not only is it being built for the Rams and Chargers, but will host Super Bowl LV in 2021, College Football Championship Games and NCAA Final Fours. The Rams will play at the Los Angeles Coliseum and the Chargers at the StubHub Center until the stadium is finished. Construction began in January 2016.